The following is a guest post by Keith Knittel. 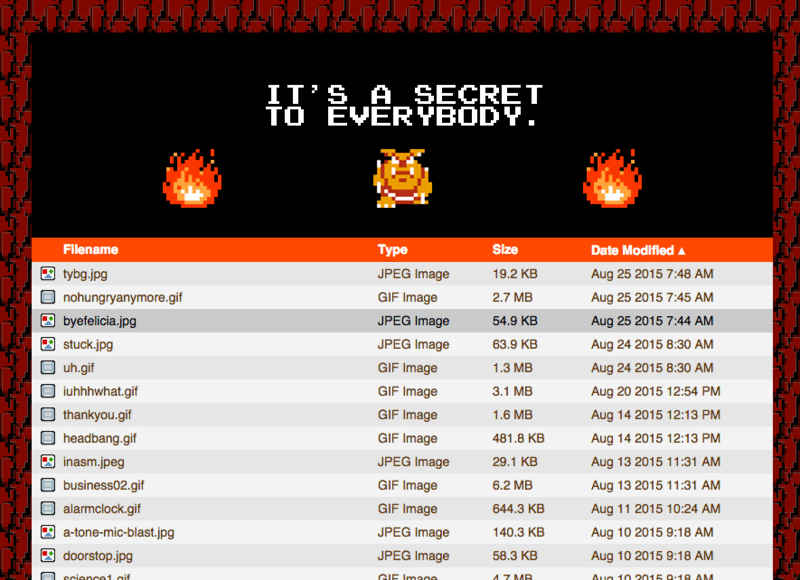 Keith used a tutorial on this site to build his own customized file directory. I was like, hey, that oughta be a better-explained tutorial on this site. So here we are. It would render `index.html`. But what if `index.html` (or the like) was missing? You can configure that behavior. You can configure it to deny access to that directory. 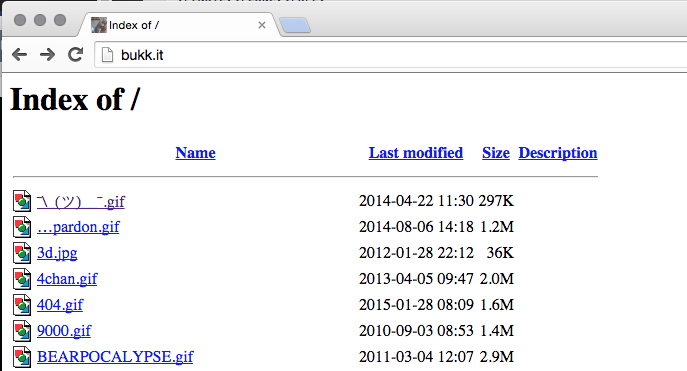 Or you can allow it and have it spit out a browseable file directory (sort of like FTP). That can be useful. Just upload files and they immediately appear, no code changes. But a bit boring. Ethan Marcotte's bukk.it is a classic example of a default directory. We’ll also use an easy way to "hide" certain files in our directory to keep them from showing up in our final file list. For context, here is a demo. First we'll make sure the server is configured to show hidden files. We'll be using file names like `.index.php` (Note the "." at the start of the file name). An operating system-specific Google search will likely find you an answer. We'll be using hidden files to make this work, so we'll need to be able to see them to work with them. Having them be hidden means they ultimately won't show up in the directory listing, which is generally preferable. It would be a good idea to add error redirects, but for the sake of this quick tutorial we'll only add a 404. Aside: You can add any page in your directory in place of ".index.php" or ".404-error.php" and it will load that page. Neat. This is a simplified version. There is a more robust one here that cleans up file extensions, directories, hidden files, and more. You can do any styling you like! There is a collection of table designs over on CodePen. The beauty of this setup is it's really easy to upload non-sensitive files and share them as fast as you can refresh the page and send a link. If for some reason you wish to revert to the default unstyled directory, you can simply go to the htaccess file and replace DirectoryIndex .index.php with Options +Indexes and your back to the default directory. Nice work, Lorenzo. I like the single file configuration. Am using it. I use a project called Apaxy. It do basically the same thing, but it doesn’t use PHP. A good tutorial. For everyone interesteed: H5AI is another alternative (very feature complete) out-of-the-box solution. I don’t get it, maybe I didn’t understand, if the idea is only to show the files list, why dont put a index.php that show a list directory in that folder so you dont need to mess with .htacces nor hidden files and if you want you can make the index.php to ignore itself in the files list. Or did I miss something here? I think one of the advantages this way is recursive. You don’t have to put an index.php file in each directory, it just keeps working all the way down. Until, since we’re already assuming Apache httpd, we’re using IndexOptions FancyIndexing to make the listing sortable, and HeaderName to insert any html we want in the output. This one suits my simple needs. Too bad you need PHP for this. An interesting tutorial would be how to style and add JS to the existing apache-generated listing (lots of interesting points to deal with on those pages :)). Just a simple php page with inline css and base64 webfont. Thank you for the tutorial ! Pretty cool, Zelda rules! I did something of the sorts, but I’ve aimed for something more clean designed. Why use PHP for this? If you’re using Apache, just style the built-in version. You can use the HeaderName directive to add HTML above the listing, ReadmeName to add HTML below the listing, and IndexStyleSheet to change the CSS file used.